Decorative card rack, XF65, English, unknown maker, early nineteenth century, mahogany with light wood plaques and stringing. ©Sir John Soane's Museum, London. Photograph: Hugh Kelly. With the days of the week inscribed on light wood inset plaques and painted roses just above the bottom edge; stringing forms a diamond at the bottom and a diamond with incurved sides at the top; each division has serpentine sides and a shaped top. One of a pair with XF173. 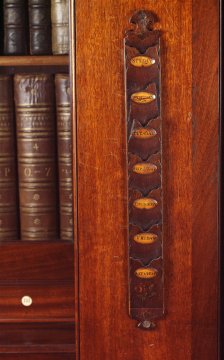 These racks were probably in the room from 1812 and one of them is shown in the view dated 29 October 1825. The width of the racks and their position (with little room for cards to project either side) indicates that they were probably designed to hold calling cards, placed into the slot for the day of the week on which they had been left. They might have been used for invitations but it is hard to see how they could have held large pieces of card, although there are some signs of filled fixing holes which may indicate that they originally hung further up the wall, well clear of the small sculptures which they abut rather awkwardly as hung at present.